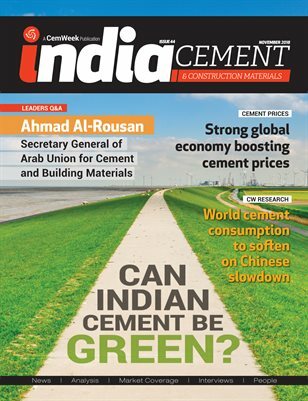 The 44th issue of ICCM analyzes how the Indian cement industry is incorporating green technology and paving its way towards sustainability and the production of green cement. Ahmad Al-Rousan, Secretary General of the Arab Union for Cement and Building Materials, discusses how oil prices, terrorism and the global economic crisis are impacting construction projects in the region. CW Research analyzes the global cement consumption landscape over the first half of 2018 and explains how the shrinking Chinese cement demand, coupled with the latest trade and geopolitical events, is bound to shape global cement demand in the coming years. ICCM also looks back on the evolution of cement prices over the third quarter of the year, which were supported by an overall healthy economic environment.